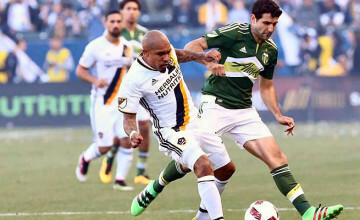 In the first leg of the Western Conference semifinal the Portland Timbers led FC Dallas by a slim 1-0 scoreline when, in the 53rd minute, midfielder Diego Chara sent a perfectly weighted through ball to forward Fanendo Adi. Adi got a foot onto the pass before FC Dallas defender Matt Hedges shouldered the big Nigerian to the ground. Referee Ted Unkel pointed towards the spot of the incident but kept his whistle at his side. No foul. In the heat of that moment, several FC Dallas players stood around and watched as defender Zach Lloyd jogged to clear the ball. Timbers winger Lucas Melano, by contrast, sprinted towards it, sticking out his foot just in time to get a toe to the ball and poking it right into the path of fellow winger Dairon Asprilla. Asprilla took one touch, then another, faking out his defender and cutting the ball back onto his right foot. With his defender now safely to his left, Asprilla gave himself just enough time to wind up and put all of his power into a right-footed shot some 25 yards from goal. The ball went dipping and curving, dipping and curving. FC Dallas goalkeeper Jesse Gonzalez remained rooted to his line, perhaps expecting the ball to sail harmlessly out of play. Instead, Asprilla’s shot, the very definition of a golazo, caromed off the top crossbar and into goal. A ridiculous, improbable shot that fooled everyone until the moment it crossed the goal line. And all of that happened in just a matter of seconds. As Asprilla ran to the corner flag to salsa in celebration, over 21,000 fans simultaneously rose out of their seats and let loose a deafening cheer that nearly drowned out the television commentary. 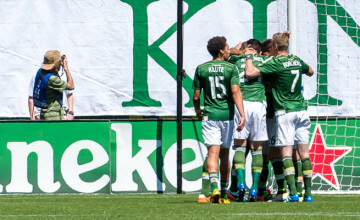 Just like that, the Timbers had a 2-0 aggregate lead against the visitors, a lead they would not relinquish in the 3-1 victory. A most spectacular goal indeed.